A piston is a short sliding metal disc that is part of the engine. Extreme care should be taken when removing the position from its cylinder. Improperly removing the piston can result in engine damage. It is therefore recommended you refer to the downloadable factory repair manual to lean how to remove piston correctly. The following information shouldn’t be used as factual guide on how to remove piston. It should be used to gain an idea of the level of difficultly to remove the piston and tools that might be required. begin by removing the circle clip from the piston. Make a note of the piston orientation with circle clip removal notch facing rear or front. It should be noted on some models the piston is non-directional. Therefore a new piston can be reinstalled with the circle clip notch facing either way. However, if you’re installing a piston that has been used before, you must install it in the same direction as removed. Remove the piston circle clip and push the piston pin out of the piston. In some cases it may be necessary to heat the crown of the piston slightly with a small propane torch. Make sure you don’t apply heat to the piston rings. Doing can cause the ring to lose radial tension. 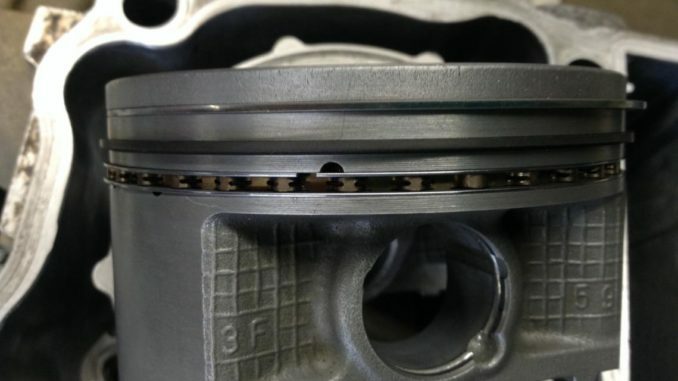 Remove the top compression ring from the piston. This can be done using piston ring pilers. Use the piston ring pliers and carefully expand the ring and lift it off the piston. Never expand the ring more than it needs to be, just enough to remove it from the piston. You can remove the ring by hand, see repair manual for directions. Repeat the same procedure for the second ring on the piston. The third ring or the oil control ring is a 3 piece design consisting of a bottom and top steel rail and a center expander section. The top rail has a locating tab on the end that fits into a notch (see images in repair manual) in the upper oil ring land of the piston. You must make sure to remove the top rail first, then remove the bottom rail. Again, it’s highly recommended you download the factory repair manual. High-definition images are included in the manual so as to help you remove the piston properly and efficiently. 1999 Polaris Sportsman 500 4X4, 2000 Polaris Sportsman 500 Four-wheeler.